BOSTON — Ryne Harper went from anger to joy in less time than it takes for his biting curveball to generate a swing and miss. At first, he couldn’t believe what Tacoma Rainiers’ manager Pat Listach was telling him on Friday night at Cheney Stadium. Despite being the best performing reliever in the Rainiers’ bullpen with a 2-0 record, three saves and 1.89 ERA in 15 appearances, Harper was being told he was demoted to Class AA Arkansas for a short time. It made no sense to him. Listach told him to check the travel itinerary carefully to make sure he could make his flight. Harper scanned the document closely. The flight said he was going to Boston where the Seattle Mariners were playing. Listach finally broke his act, and told Harper he was going to the big leagues. Harper immediately called his parents, brother and girlfriend to tell them the life-changing news. While some players seem destined to be big leaguers because of talent and reputation, Harper’s path was never preordained. He doesn’t have a plus fastball or the typical velocity that scouts look for. His best pitch is curveball, which he’ll throw 75 percent of the time. The Braves selected him in the 37th round of the 2011 draft out of Austin Peay University. Seattle acquired him as the player to be named later in a trade that sent right-hander Jose Ramirez to Atlanta in December of 2015. Harper made 42 appearances with Class AA Jackson last season, posting a 4-5 record with six saves and a 2.51 ERA. In 69 innings, he struck out 95 batters with 25 walks. But he wasn’t an invite to big league spring training. Now he’s pitched his way to Fenway Park. Rob Whalen was optioned back to Tacoma. He made the spot start on Saturday, pitching 51/3 innings and allowing five runs in a 6-0 loss.s. James Paxton rejoined the Mariners after his one-start rehab stint with Class AA Arkansas. 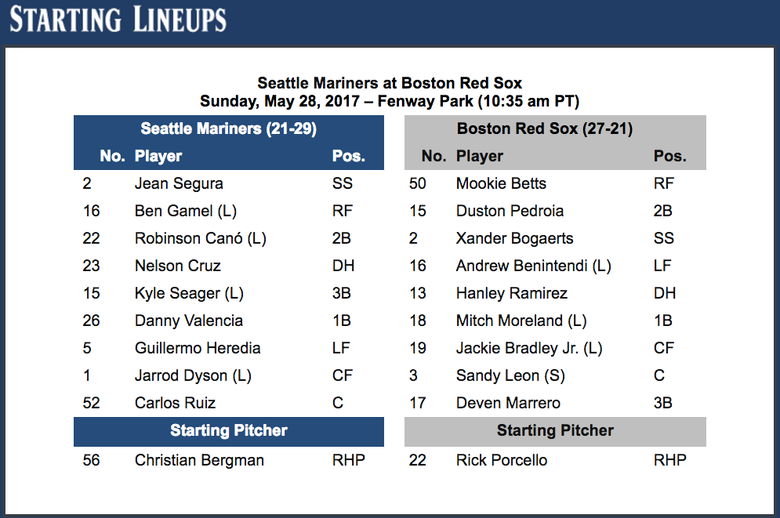 Paxton threw a bullpen on Sunday at Fenway Park and is ready to start on Wednesday against the Rockies at Safeco Field.